Publisher: Blue Orange Games. Designers: Bruno Cathala, Ludovic Maublanc. Artist: Sylvain Aublin. Year Published: 2018. Players: 1-4. Time: 20min. Age: 8+. WEIGHT: 1/5. POST BY CATHY. Visual puzzle games are my nemesis. Trying to fit oddly-shaped pieces together while also planning places for future oddly shaped pieces to go…it’s IMPOSSIBLE! And when a game like that comes to the table, I just expect to lose and want to get it over as soon as possible. So when we pulled out Scarabya and I saw those piles of polyominoes, I groaned internally but put on my bravest fight face. And yes, as expected, I failed miserably. Worse than miserably. But the surprising thing is…I actually had fun doing it. And every time I played I did better and better until I finally got the hang of it. 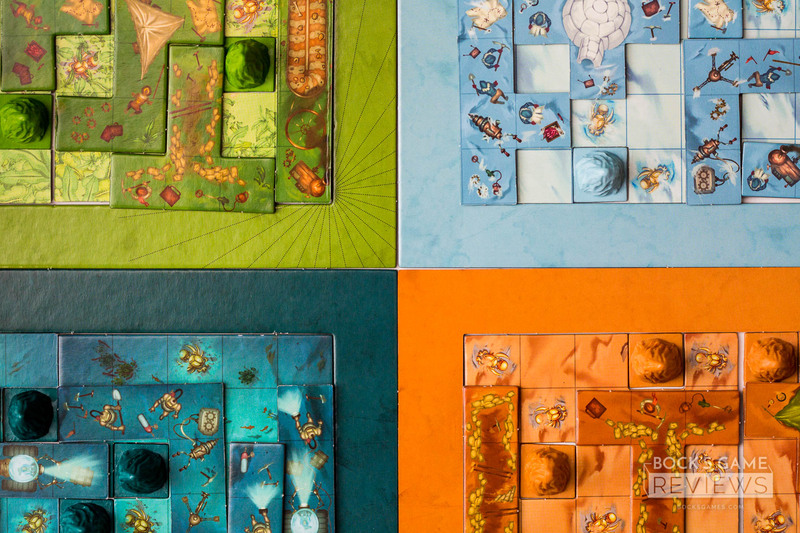 In Scarabya, each player has their own modular board of squares (10 x 10) littered with tiny scarabs and a pile of oddly-shaped polyominoes. 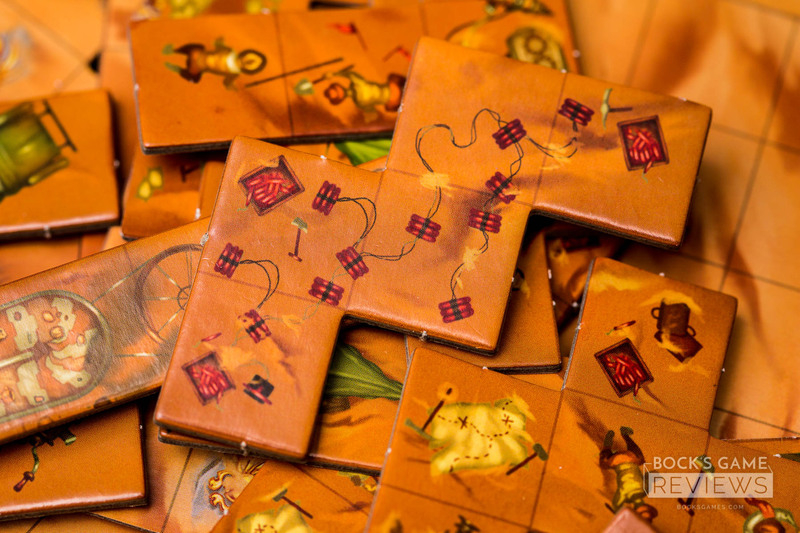 A card is revealed from the deck and all players must place the pictured polyomino on their board, making sure it’s touching a previously placed piece. The goal, however, isn’t to fit the pieces snugly together like you would expect. 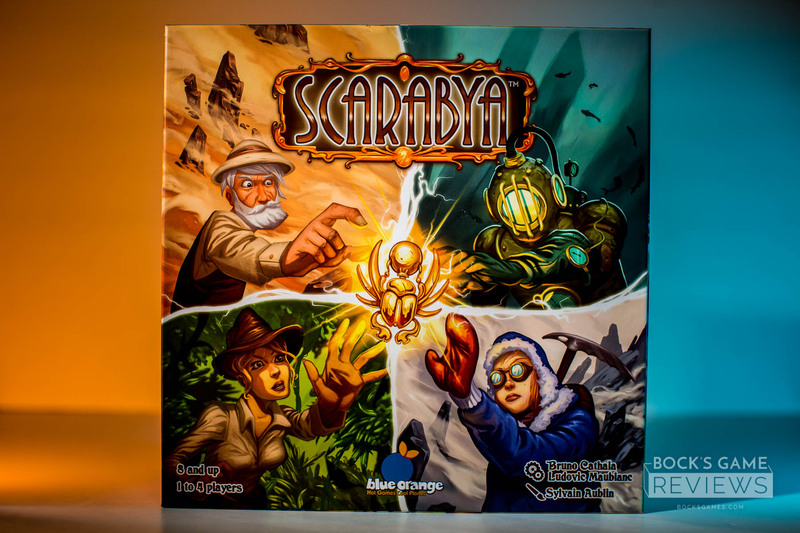 In Scarabya, you actually use your shapes to surround areas of four or fewer squares, creating “excavation sites”. 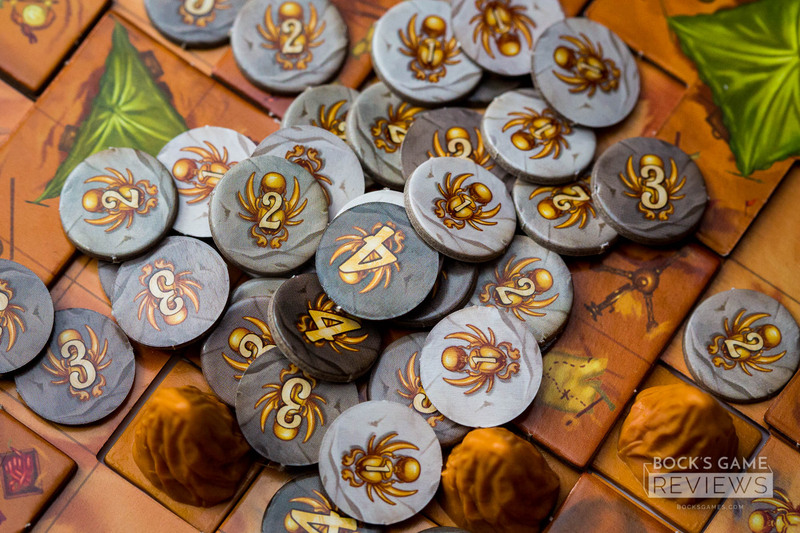 Any of those little scarabs illustrated on your player board that get trapped in those excavation sites score you points based on the site’s size. So each scarab trapped in a three-square excavation site is worth three points. My favorite part of this game, though, is the art. 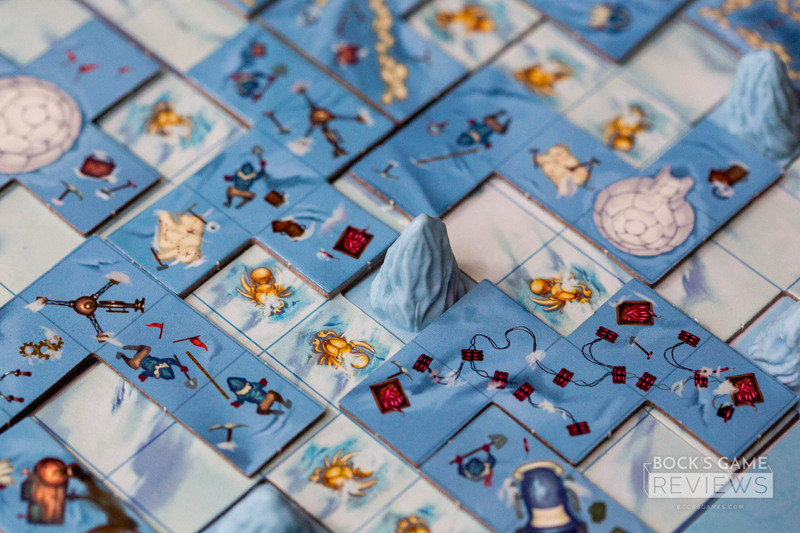 Each player has their own landscape to work in–underwater, desert, forest, or tundra–and the polyominoes are covered in these tiny, beautiful illustrations. As you place them, you are filling out your landscape with little workers, vehicles, plants, and other tiny details. My only complaint would be the component quality. 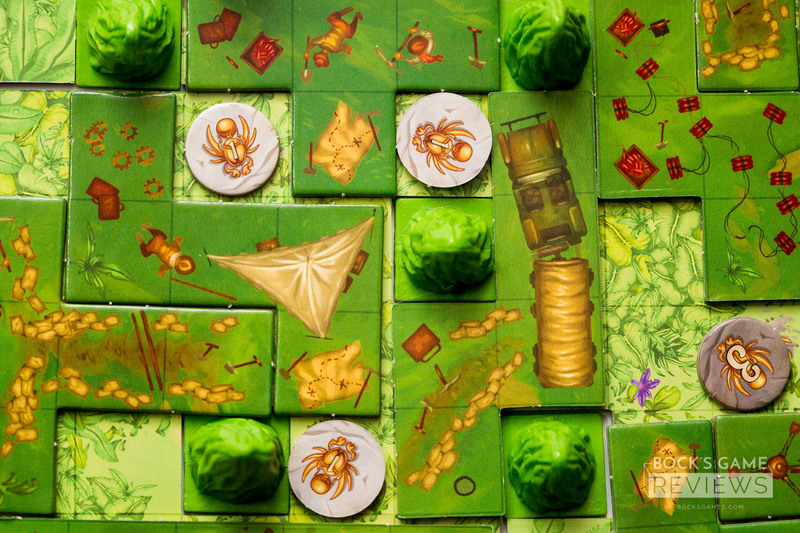 The cards are fine, and I LOVE the little plastic mountains that give your landscape a three-dimensional feel, but the cardboard polyominoes are already showing a little wear and tear. 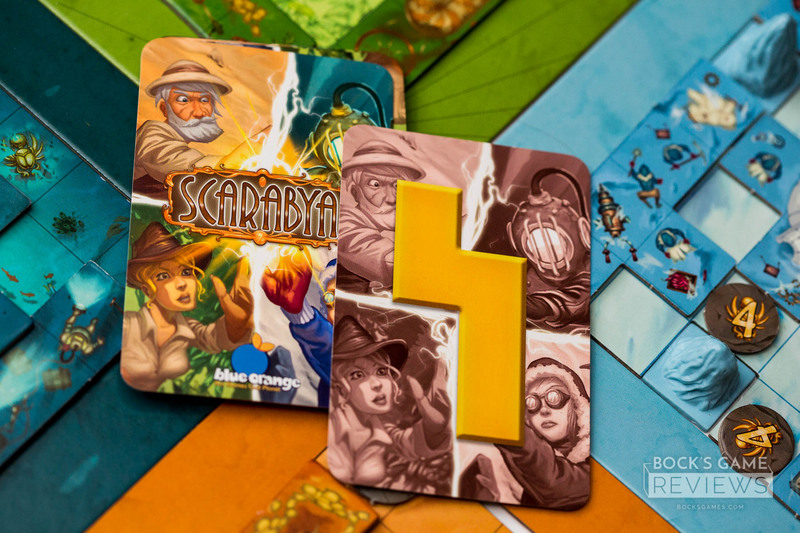 Scarabya is a quick, fun game that I keep in my bag as a filler or end-of-the-night game. Will it stay in our collection? I’m not really sure yet. While the puzzle of this game was a huge challenge for me at first, it hasn’t stayed that way. I may not have completely mastered it yet, but the better I get, the less interesting it is to play. If you are looking for a fifteen-minute game to add to your collection that’s easy to teach to gamers or non-gamers alike, I absolutely recommend giving this one a try. It may not have a lot of staying power if you’re planning on replaying it frequently, but it will give you a fun challenge at least for a little while.